The vampire myth originates in ancient beliefs in demons or evil spirits who feed on the blood and flesh of the living. Cultures all over the world have a version of a blood-sucking creature that returns from the grave to torment and feed on people. The creatures in these ancient myths eventually gave way to bloated folkloric vampires that spread disease and the charismatic fictional vampires that consume the living and give eternal life. In New England in the 19th century so many people believed that their dead family members were climbing out of their graves to kill relatives that the issue was addressed by incredulous academics and reporters in journals and newspaper articles. According to Paul Barber, author of Vampires, Burial & Death, there are two types of vampires: folkloric and fictional. Fictional vampires are supernatural creatures seen in movies and television with = pale skin and long sharp teeth. The fictional vampire was popularized by Bram Stoker’s Dracula (1897) but was influenced by the folkloric revenants of Central and Eastern European cultures. For the Slavic people an upir, or ubir, was an unclean spirit that possessed a decomposing corpse. While the Romanians believed that a strigoi was made when a troubled or mischievous person dies. Both the upir and strigoi returned to drink the blood of relatives and fellow villagers, which eventually caused illness or death. These revenant traditions likely evolved out of a misunderstanding of disease transmission and post-mortem decomposition. If a village was struck by a disease epidemic, many Europeans believed that the first person to die had become a vampire and was attacking their village causing additional deaths. To confirm a case of vampirism, villagers exhumed the suspected revenant’s grave. If the corpse had a bloated chest, sloughing skin, discoloration of the face, bloody mouth, long fingernails, or was in a state of inexplicable preservation then the diagnosis of vampirism was confirmed. Forensic scientists now know that during decomposition bodies bloat because of a buildup of gas produced by bacteria, skin slips off, skin discolors because of marbling and livor mortis, dark purge fluid escapes orifices, skin around fingernails retracts making them seem to grow longer, and if a body is buried in the cold ground during winter it will likely take longer to decompose. Almost any corpse would be considered a vampire if it was exhumed at the right time. At the end of the 19th century there was a well-documented vampire panic in New England. 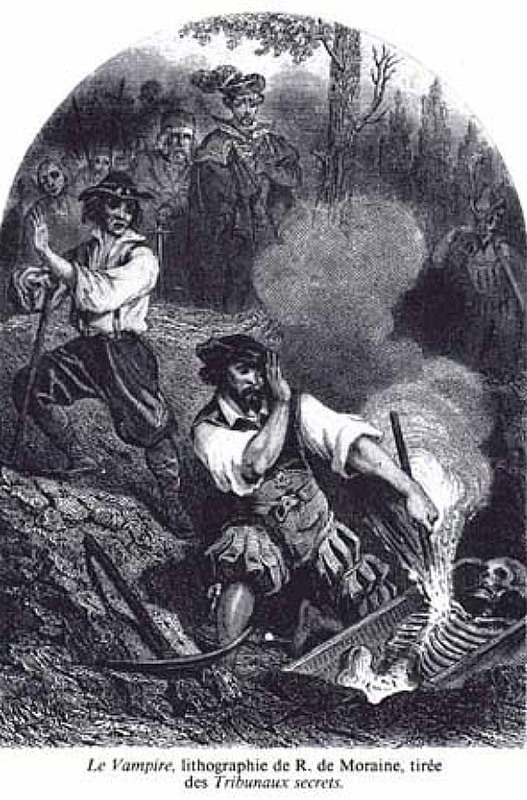 The folkloric vampire of New England was very similar to its European counterpart, likely because of the immigrants that settled in the area. People in Rhode Island, Connecticut, Massachusetts, and Vermont believed that their dead relatives were rising from the grave to spread consumption, or tuberculosis, to the living. Sledzik and Bellantoni estimate that there are 12 documented accounts of vampiric attacks in New England, in 11 of those 12 attacks consumption was noted as a cause of death. Tuberculosis is caused by a bacterium from the genus Mycobaterium, two of which infect humans: M. tuberculosis and M. bovis. M. tuberculosis, also known as consumption, infects the lungs, and is spread via contaminated bodily fluids (i.e. saliva or mucus) that are dispersed during a cough or a sneeze. Symptoms include chronic cough, coughing up blood and mucus, fever, weakness night sweats, and weight loss. Once in the lungs the infection can spread through the blood stream to other parts of the body, including bones. Tuberculosis is a disease historically associated with poverty, overcrowding, and malnutrition. It’s also a disease that would have spread among multi-generational families living under one roof. Tuberculosis was a major cause of death of humans from the 17th to 19th centuries. The fear that vampires were causing the death of consumptive relatives was so widespread that the president of the Washington Anthropological Society, George R. Stetson, wrote an article titled “The Animistic Vampire in New England” that was published in the 1896 edition of the American Anthropologist. These New Englanders believed that the only way to stop these vampiric attacks and the spread of consumption was to dig up the suspected vampire and render it incapable of rising out of its coffin by burning its organs or body or beheading it. The vampire slayings of New England are documented in newspapers and even in the archaeological record. “The Vampire”, lithograph by R. de Moraine (1864). Image credit: Wikipedia. In November if 1990 children playing near a gravel mine in Griswold, CT discovered an abandoned cemetery used by the Walton family in the 18th and 19th centuries. The skeletal remains of 29 people were examined by Paul Sledzik, a forensic anthropologist who worked at the National Museum Health and Medicine in D.C., and Nicholas Bellantoni, an archaeologist with the Connecticut State Museum of Natural History. In their article, published in the American Journal of Physical Anthropology, Sledzik and Bellantoni argue that the bones in burial #4 displayed signs of a vampiric slaying. The body in burial #4 was interred in a coffin with “JB-55” spelled in brass tacks on the lid. The bones belonged to a male between 50 and 55 years old who died in the early to mid-1800’s. J.B.’s skull and femora had been rearranged in a “skull and crossbones” on top of his ribs. Sledzik and Bellantoni also found lesions in the ribs, consistent with a chronic pulmonary infection like tuberculosis. The “Jolly Roger” assembly of JB’s bones suggests that there was very little soft tissue left on the corpse when the body was unearthed the first time, which meant that there were no organs to burn to stop vampiric activity. Sledzik and Bellantoni “hypothesize” that the body was beheaded as an alternative to burning the heart. Vampyr by Edvard Munch (1895) Image credit: Wikipedia. On May 30, 1854 The Brooklyn Daily Eagle reported on a “strange superstition” found in the Norwich Courier. Horace Ray of Griswold, CT had three sons. Horace died of consumption around 1846, followed by two of his sons soon after. When the third boy was diagnosed with tuberculosis, friends and family of his two dead brothers broke into their cemetery in Jewett City, exhumed their bodies, and burned their remains. Grave stone of Mercy Brown. Image credit: Wikipedia. Mercy Lena Brown lived in a farming community near Exeter, RI. Her mother and sister died of consumption in 1882 and 1883, respectively. Then Mercy died from the same disease when she was 19 years old on January 17, 1892. Mercy’s brother Edwin had contracted tuberculosis before she passed, but worsened shortly after her death. Friends of Mercy’s family spoke to her father, George, and suggested that one of the deceased Brown women had turned into a vampire and was feeding on Edwin. The locals asked George to exhume the bodies of his wife and two daughters to see if their hearts contained fresh blood, one of the telltale signs of vampirism. The villagers were convinced that Mercy’s preserved body and bloody heart (although not fresh) was evidence she was a vampire. So they burned her heart and liver and fed Edwin the ashes in the hopes that the cremated organs would treat his consumption. All of this was for nothing because Edwin died a few weeks later. After Mercy’s much publicized exhumation, George Stetson went to Rhode Island to inquire about the vampire panic in the area. He used the information from this trip to write his 1896 article.